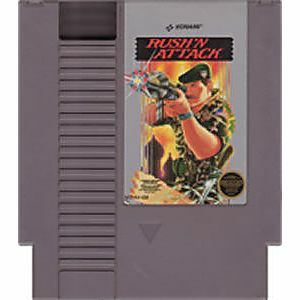 Rush'n Attack is an action/platform arcade game set during the Cold War in which players must infiltrate an enemy military base and stop the bad guys from carrying out their nefarious plots. The enemy holds prisoners of war deep in their base and it's up to you to rescue them. Using your trusty knife and other weapons you find, fight your way through four stages to free your compatriots and escape safely. This game is not easy but is a lot of fun. I have many hours of gaming to come. Wonderful Blast From The Past! Worked amazingly and led to hours of memories and good times! Thanks Lukie Games for keeping such wonderful products on the market! This is a pretty fun game. 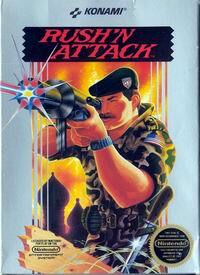 It's simple control, nice graphics and challenge make this a jewel in Konami's game library. I recommend it for those who like a challenging side-scroller every now and then. A simple take on your traditional side scrolling action game. The game plays it safe using easy control, simple gameplay and decent graphics. 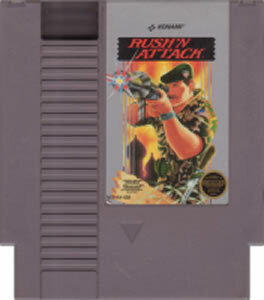 This game is a great little pick up when you need that quick action fix. It is exactly the way I remembered it when I use to play it at my friends house when I was a kid. The memories alone definitely add a biased opinion to this review. But at least it comes from the heart! Enjoy!